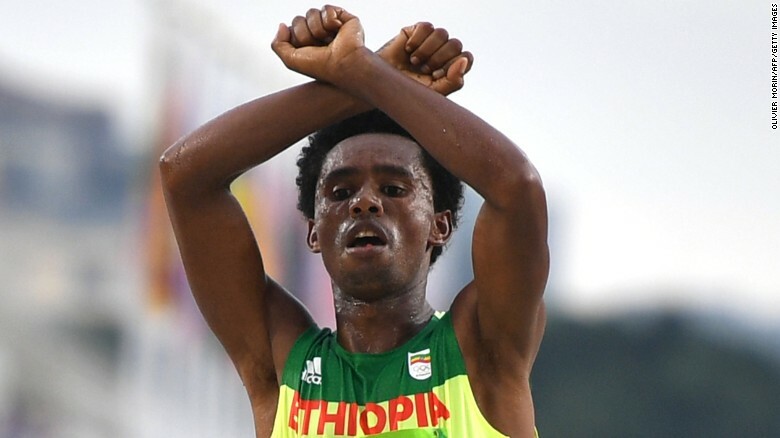 Recently, someone asked me to state what was so important about Feyisa making a “statement” at the Olympics and what Oromos and their community associations are doing about it in response. The following was part of my response to him. Athlete Feyisa took the Oromo protest to the world stage. And he did so in the most dramatic fashion in the marathon race just before the closing ceremony. In doing so, he unveiled the long suffering Oromo struggle to the entire world. By using the only platform he has a professional athlete—and by putting his professional and personal life on the line—he brought the Oromo cause to the attention of the world community. It is important for all Oromos because Oromos have long been suffering from lack of voice. As people rendered inaudible and invisible by the conspiracy of the dominant politico-legal systems of the international (the West, the EU, the UN) and the national (Abyssinia-Ethiopia), they struggled to get a hearing. The notion of sovereignty of nation states exerted on the international plane was deployed to full use in order to silence and mute the voice of sub-state entities such as the Oromo and other indigenous peoples that suffer from the legacies of settler colonialism across the globe. The Oromos were not legible to the international system. For over a century now, they have been rendered virtually invisible and their voice was made completely inaudible. It is this invisibility and inaudibility that Feyisa’s gesture of resistance in the Olympic village of Rio broke through. His extraordinarily brave act shattered the ‘polite’ silence of the world, especially that of Ethiopia’s Western allies that serve as its patrons (such as the USA), around Ethiopia’s practice of mass murder, mass arrest, dispossession, and unrelenting displacement of the Oromo and other indigenous peoples of Ethiopia’s wider South. At home, the Oromo have been in a continuous protest movement, especially since the unveiling of the Addis Ababa Master Plan in April 2014. After an initial violent repression by the regime of the predominantly student-led series of demonstrations in 2014 (in which over 140 Oromos were killed), the protests were reignited in November 2015. Since then, the Oromo people from all walks of life have been demanding a hearing from the regime.They were trying to reclaim a voice in the country they were rendered invisible except for bearing the heavy brunt of suffering. They were demanding to be taken seriously. Throughout, they have been presenting their historic demands for sovereignty over their land; a referendum for exercising the constitutional right and basic human right of self-determination, autonomy in the form of self-rule in the Ethiopian federation; a halt to land grab policies AND practices of the regime that are virtually dispossessing and displacing the Oromo from their ancestral homes; and respect for their right of identity, cultural integrity, and linguistic justice in Oromia and in the wider country. They were demanding social justice (freedom from exclusion, exploitation, and oppression). They were seeking for their human right to be free from arbitrary arrest, detention, torture, and insinuations as terrorists, separatists, extremists or otherwise criminals under unjust set of laws and judicial practices. They were demanding that Finfinnee/Addis Ababa, as their own city, be accommodative of the ownership right and, that at the very least, the regime sees to it that the so-called ‘constitutional special interest’ of Oromia be fully and completely implemented. They were thus demanding a fairer share of capabilities, resources, and opportunities in the city. They were seeking a better cultural presence and representation in the city. In short, they were seeking a genuinely co-equal citizenship and co-equal ownership of its state. By this, they were simply asking a complete structural transformation of a polity that is historically constructed on an unjust foundation at the expense of the Oromo and the ‘other’ peoples in the wider South. As we all know, of course, these are demands of the Oromo national struggle since the Second World War and beyond. It was this long suppressed demand for a hearing that finally found expression in the immensely courageous act of Athlete Feyisa Lelisa as he crossed his hands while crossing the victory lines of his marathon race. It was this long suppressed, contained, and/or repressed voice that exploded into the global stage on the 21st of August 2016. It was this attempt by Oromo activists and political leaders to unmask the true face of the Ethiopian regime that finally found expression in his acts. Since this dramatic act of the athlete was seen, hundreds of media outlets have reported on the Oromo protests throughout the whole week non-stop. The silence was finally broken. The appeal to the global public conscience has finally found a traction. Through one heroic act, Athlete Feyisa could beautifully galvanize the world’s media and could force them to pay attention, and to bear witness, to the Oromo suffering. Because of Feyisa’s act, the Oromo resistance movement now seems to gain a new momentum that can possibly get a traction in the diplomatic corridors of the international community. The issue of the Oromo cannot be wilfully hidden any longer. Nor can it be conveniently ignored. However imperfectly at times, it has been extensively reported upon. Feyisa’s act of solidarity with the Oromo protests is this big, this significant, for the Oromo struggle for emancipation. I think the nation is eternally grateful to him for his immensely courageous and patriotic act. I, for one, will never tire of singing his praises. And of course, the response to stand with him in this season of difficulty for him and his family is simply unbelievable. The love, care, concern, and best wishes extended to him from people from all walks of life is simply astounding. Quite literally, he is flooded with love. The nation embraced him. Thousands, perhaps millions, of people have been asking us if there is a way to help him be safe and well. How is the community of Oromia people in the United States and around the world helping him and making sure he will be safe in Ethiopia or somewhere else? Well, Oromos from across the globe have been reaching out to him for help. I know that the International Oromo Lawyers Association (IOLA) has volunteered to offer necessary legal assistance services. A team of lawyers are coordinating their efforts to ensure that he is safe and will get to a place where he can resettle. The same team is also working to see to it that his family is safe and their needs are properly met until they get reunited with Athlete Feyisa. I also know that a team of social media activists have raised over a 150, 000 USD through GoFundMe. Numerous Oromo individuals are reaching out to him to wish him well, to ensure his safety, and to assist him in any way they can. As I said earlier, the nation has embraced him as its most distinguished hero. His name has been transfigured to take a different politico-theological meaning. I am sure his story will take up a pride of place in the more glorious archives of history. History owns him now. He belongs to the category of the immortals. Oromo Community associations in the US, Canada, Australia, Europe, and other places are trying to organize themselves in extending help to the athlete. They are also trying to regroup and support the protest movement by further intensifying their engagement with the international community including the governments of the countries they are living in. I think the Community Associations will have more extensive answers on this matter than I do. So I would rather say nothing much on that. It needs to be said strongly however that now is the time for a more robust, a more effective, a more systematic engagement with the powers that be. Now is the time for action. The polite silence of the regime’s patrons is broken. The veils are removed. The regime is now exposed to the light of the world’s public opinion. And so, let us get to work. We owe it to Feyisa Lelisa and the martyrs he represents, those he ‘spoke’ of and spoke for with grand eloquence last Sunday. We cannot afford to fail him. We cannot afford to fail them.